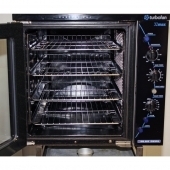 Below is additional information on the hire item "Blue Seal E32 Max Steam Oven". able to handle four 460x660mm baking trays in a 710x800mm floorspace footprint. Reversing fan for even baking. Toughened, reversable twin pane glass door. Volume Price £ 207.20 for orders of 2 units or more.